Another recipe from Rossella’s Ma che ti sei mangiato. I didn’t have any courgettes unfortunately, and I think it would have been better with. Next time I will roast and peel the pepper first for a more intense flavour. Quick to make, and vegetarian. Grill the pepper until blackened, then put in a bowl covered with a plate to cool. When cool, peel off the blackened skin and cut into dice. Put a pan of water on to boil for the pasta. Dice the courgette and slice the shallot finely. Saute the shallot in oil until translucent. Add the pepper and continue to cook. 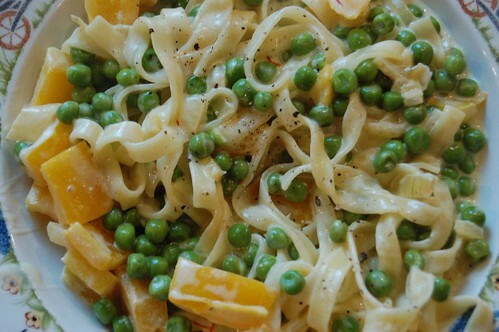 Then add courgette and peas and continue to cook with a little of the pasta water until the vegetables are tender. Cook pasta, drain, and add the saffron dissolved in a little of the pasta cooking water to the vegetables. Stir., then add the pasta and cream and mix to combine and heat through. Season to taste. greate job. I’ve just posted my entry for Taste & Create. Thanks Rossella. I’ve really enjoyed this event. Hi Veronica! I’ve popped over from the OU Food Conference. I do like to keep in touch with your great blog. I love leeks in risotto, particularly because of the sweet taste you get. I counteract this by adding finely chopped parma ham or similar at the start, and also adding a little chopped fresh sage – both introduce a salty and savoury element to the overall flavour. BTW, your bread recipe looks really interesting, a similar approach to Doris Grant’s easy wholemeal loaf that we’ve discussed over at the OU. I must try this. The effort versus results score for the bread is pretty impressive. I’m still tinkering with it to find the right balance of flour. I made some brioche yesterday, completely miscalculated the amounts while halving the recipe, and had to rescue it. It still tastes good though, and again no kneading!